In parts of the Yorkshire Dales traditional village dances have never died out. They have been passed down enthusiastically from one generation to the next. The Beresford Family for example has played and called for dances in Wharfedale over several generations. Most village dances are closely related to the 18th century Country Dances of urban Assembly Rooms and Ballrooms (as described by Jane Austen) and to the 19th century Quadrilles and Victorian couple dances of polite society. Travelling Dancing Masters taught the latest dances at the homes of the gentry as well as in the village school. The label 'Country Dance' can refer to genteel figure dances of the Assembly rooms of Bath and Harrogate as well as to village dances. The dance Butter'd Peas was originally in the formation of a 'Longways Duple Minor Set' not a Sicilian Circle. Couples stood in a long line facing their partners waiting for the top couple to progress down the set to them before they could join in the dance. Polite conversation and courtship were as much a part of the occasion as dancing. Most village dances are traditionally danced by groups of couples with the man on the left and the woman on the right of their partners. However we would suggest that dancers choose a partner of their choice and ignore gender. In ballrooms and in village dancing it was common for a variety of steps to be used, depending on the music and the dancer. It is useful to try different steps which fit the music and also to see how changing the music has an effect on the choice of steps. Today, at a ceilidh or barn dance, it is usual for a caller to remind the dancers of the next figure by calling out the name (or a brief description) of each figure, just ahead of the appropriate phrase of music. This is similar to the way in which figures are 'called' in Morris dancing. Click these links to print a page of Calling Notes for the Butter'd Peas and Goathland Square dances and music notation with calling prompts for the Butter'd Peas music and Goathland Square music. Butter’d Peas is an example of a good dance for everyone to join in. It is also useful in helping to demonstrate the relationship between the phrases in the music and the figures of the dance. Encourage learners to listen to the timing and the rhythms in the music (e.g. for the hand shaking and clapping). With young learners it can be helpful to omit the progression and make minor changes to the figures (as suggested below). Step: One two three hop, One two three hop, or whatever fits the music such as rant step or polka step. This is the name given to the way dancers are arranged for the dance. One couple faces another couple around the outside of the room. One couple is facing clockwise and the other couple is facing anti-clockwise. The dancers dance with the couple who are facing them for once through the dance and then move past the opposite couple in the direction they are facing. Then the dance is repeated with a new couple before moving on again. Dancers always progress in the same direction. 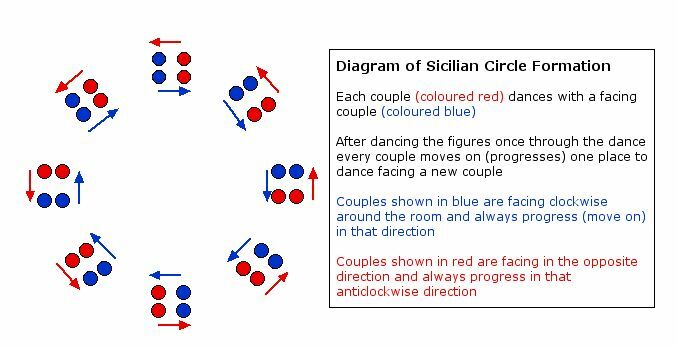 Hint – An easy way to achieve the Sicilian Circle formation is to ask the dancers to stand beside their partner in one large circle facing in. Then ask one particular couple to turn and face the couple on their left who will turn and face them. The dancers all do this in order, starting with the next couples on the left. The progression at the end of the dance can be a little tricky for some. It is helpful to practise the progression part of the dance before teaching the whole dance, repeating it until all appreciate that they always progress in the direction they are facing at the beginning of the dance. There are different ways that dancers can move to progress at the end of the dance. An easy way is for one of the couples to make an arch, dancing forward, whilst the other couple dance forward and under the arch. It’s useful to know which couple is going to make the arch. The teacher or caller can decide at the beginning whether the dancers facing clockwise around the room or the dancers facing anti-clockwise are to make the arch. Couples making the arch may need reminding that they dance towards their facing couple (who will also be dancing to meet them). They do not wait for the opposite couple to dance under their arch. The cross hand hold and swing is the style of progression usually used in Butter'd Peas, but you could use a simpler way of progressing or cut out the progression all together. Partners will then swing in their own place without moving on. If you cut out the progression Butter'd Peas is then danced in groups of 4 and need not be in Sicilian Circle Formation. However it could be useful to organise the dance in that formation so that when the pupils are ready to learn how to progress to meet another couple they have already understood the formation. This figure is frequently referred to as right and left hands across in older dance manuals though right and left hand star is probably much easier to understand. It is usually danced in fours though sometimes in sixes or occasionally even more. All the dancers put their rights hands in to join hands with the person diagonally opposite to form a star with the other dancers and then dance round clockwise the way they are facing. A right hand star is usually followed by a left hand star when the dancers change direction to come back the other way with left hands joined. Butter’d Peas has a unique way of forming a right and left hand star with fists and ‘thumbs up’. Four couples in a set. Partners stand beside each other in a square. The man’s position is on the left of his partner and the woman is on the right. In many square dances the couples are numbered and dance particular figures in turn. Sometimes they are just called ‘head couples’ and ‘side couples’ when this is sufficient. In English village dances, couple number one is the couple standing at the top of the set with their backs to the musicians. The second couple are on the right of number one, the third couple are opposite couple number one, and the fourth couple are facing couple number two. 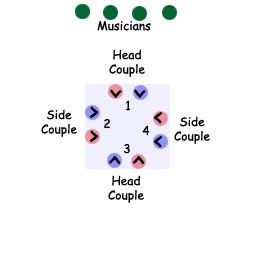 The head couples are the 1's and 3's, the side couples are the 2's and 4's. This figure is danced in a circle. The usual start is for partners to face each other, the women facing clockwise and the men anti-clockwise around the circle. Dancers then dance all the way round the circle back to their own place. As they pass a dancer they link hands and move on to the next dancer without turning round. The Grand Chain starts with partners giving right hands and passing right shoulders before moving on to the next dancer and giving left hands and passing left shoulders and so on until they arrive back in their places. In Goathland Square 8, when dancers meet their own partner halfway around the set they have a short swing before taking left hands with the next person and moving on in the same direction as before, i.e. women clockwise, men anti clockwise (take care with this - it can cause confusion!). Partners swing again when they get back to place. On the last time through the dance it is common to continue swinging for an extra 8 bars of A music at the end of the dance. Playing for village dances is similar to playing for morris. It is essential to phrase the music to help the dancer to know where each figure begins and ends. It is also essential to choose a tempo which suits the style of movement and the surface and space available for dancing. Open the pages Butter'd Peas music and Goathland Square music to print music notation with calling prompts attached to the relevant musical phrases for each figure. When using written notation beware of being influenced by the position of barlines and by the beaming together of quavers. These visual features of printed music are nearly always misleading. For the most part phrases do not start and end at barlines. Quaver groupings are often played with some quavers slightly longer or shorter than others and sometimes with an off-beat emphasis. Written notation is usually very inexact with no indication of articulation, accents, ornaments, or precise note lengths, and all of these are in any case subject to variation with each repeat of the tune. It is best to learn the tunes aurally. Listen to the music of the video clips and to other good dance musicians. Ideally, learn to sing the tunes before playing them on a suitable melody instrument. Most people can pick up songs and sing them expressively without ever seeing written music notation - try to learn and perform dance music in the same way. Playing by ear also makes it possible for you to watch the dance as you play, so that you can respond to the dancers and help them with your timing, phrasing and rhythm. Although many people like to use rhythmic accompaniments there is much to be said for recognising that traditionally the rhythm was provided by the melody. In particular, a regular metrical beat is not a good idea, not only because it acts as a straightjacket, masking the complex rhythms which are an integral part of the melody, but also because it can obscure the phrasing which is such an important part of these dances.